We kept our position 175 miles south of our eddy all day today. During part of the day we switched out some of the equipment we will be using. 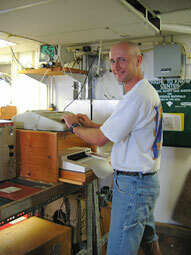 The sampling sled was put together and the gas chromatograph was set up to analyze the samples we will collect. We will probably return to the eddy on Tuesday and begin our samples to determine the vertical mixing that has occurred. The storm might be our some value since it will probably stir up the water and ensure greater mixing.